In her paper, Twenge looks at four studies covering 7 million people, ranging from teens to adults in the US. Among her findings: high school students in the 2010s were twice as likely to see a professional for mental health issues than those in the 1980s; more teens struggled to remember things in 2010-2012 compared to the earlier period; and 73% more reported trouble sleeping compared to their peers in the 1980s. These so-called “somatic” or “of-the-body” symptoms strongly predict depression. College students also feel more overwhelmed; student health centers are in higher demand for bad breakups or mediocre grades, issues that previously did not drive college kids to seek professional help. As an educator, this information confirms much of what I’m seeing in schools since I’ve started my teaching career. As a parent of four young children, this scares me. Peter Gray, a psychologist and professor at Boston College, sums it up in an article he wrote in Psychology Today. So, what is going on? 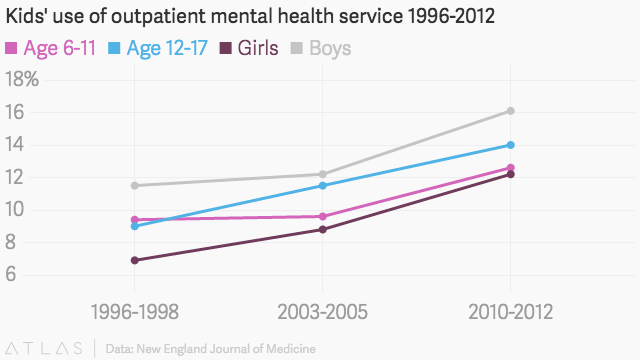 This trend is continuing even as we bring mental health to the forefront of many discussions, try to add more help into schools, and spend time analyzing this type of data. The two professors have slightly different opinions on the root cause of this reality, but I believe their reasons overlap in a few places. Twenge has observed a notable shift away from internal, or intrinsic goals, which one can control, toward extrinsic ones, which are set by the world, and which are increasingly unforgiving. Gray has another theory: kids aren’t learning critical life-coping skills because they never get to play anymore. As a parent, I see both of these theories impacting my own kids, and as an educator, I question what direction many schools are headed in when we look at the role of “play” and “intrinsic goals” in our current system. Let’s think for a minute about education. Not reactive education, but proactive education. Reports come and politicians panic. Our nation is at risk and the media panics. They all the say the same thing: How can we fix our nation’s broken education system!? We are so caught up in reactive education that our pre-schoolers are now being assessed based on common standards. If this seems like a good idea to you, please tell me why? I have a 4-year-old son who loves pre-school. He loves building crafts and listening to books read aloud. He enjoys playing with his friends and going on field trips to see the firehouse and picking pumpkins. In fact, he just loves to learn in this type of school setting. The best part about his pre-school is that no one is testing him on this learning. Instead, they are giving positive feedback and encouraging him to keep trying new things. To keep playing. His teachers challenge him with all kinds of different opportunities. Many parents feel the same way when their child is in pre-school or kindergarten. School is fun. It’s exciting with endless possibilities. There is this sense of enchantment. I also have a 7-year-old daughter who is in first grade. She loves school as well. But I’m already starting to see a change. She has homework. She has quizzes and spelling tests. She is beginning to notice that school is as much about following the rules, as it is about having fun and learning. According to Daphna Bassok, an assistant professor of education and public policy at the University of Virginia, in 1998, 30% of teachers believed that children should learn to read while in kindergarten. In 2010, that figure was at 80%. That is a huge change in expectation, in 12 years time! I’m all for the push to get students to read, but I also question what is developmentally appropriate in many of these new expectations. If the rise of anxiety and mental health issues wasn’t a telling enough sign that we may need to change some of our practices, policies, and expectations, how about the steady decline in student engagement as they go through our K-12 system. I’m going to let that soak in for a moment (I had to personally look at the charts a few times after seeing them on Scott’s blog). Student anxiety and mental health issues are on the rise. Student engagement declines each year a student is in school. Interestingly enough, it seems that our students know this is happening. They know that they and their peers are often bored in school. They know that there are some serious mental health issues and anxiety problems permeating their circle of friends. Last May we ran a TEDx event in the Upper Perkiomen School District (where I work) and put a call out for students who wanted to give a TEDx talk. Our student who was selected to give the talk was a 10th grader, Pooja Girwarr. Pooja’s 7-minute talk was titled, “Becoming That Little Kid Again”, and it took us through her schooling journey from being an excited kindergartener to a stressed high school student. Then she gives some sage advice of how to fix it in a few simple steps. What can we do then? As a parent and a school leader, I’m looking for answers just like all of you. These are major problems and identifying them is only a start, not a solution. Going back to the two professors quoted at the beginning of this piece, there are at least two avenues of thought on how to fight student anxiety and lack of engagement. Play is brain-building for babies and young children. There is a sequence of how children develop, from the moral and emotional to the social and intellectual. What does this actually look like in practice? Well, for one, it means more recess/physical activity time. The research has been clear on the benefits of physical activity on student engagement and learning, yet for some reason, many schools have cut down on recess time and taken it away in order to get more instructional minutes. But what happens when you do the opposite? What happens when we add more recess and free play time into our already busy student schedule? Well, they actually do this in Finland. Finnish students not only perform at very high levels, but they are also “healthy in many regards”, says Texas Christian University kinesiologist Debbie Rhea. Rhea is leading the movement of US schools to increase recess time. One specific school, Eagle Mountain, was featured as having great results from giving students a recess break four times a day. Ohio State University pediatrician Bob Murray and his colleagues wrote up a policy statement for the American Academy of Pediatrics suggesting that kids with regular recess behave better, are physically healthier and exhibit stronger social and emotional development. Play is what we all LOVE to do. Play is where our subconscious naturally guides us. Play is the state where we are truly ourselves, once we let go of our egos and fear of looking stupid. Play immerses us in the moment, where we effortlessly slip into flow. Play allows us to imagine, to create, to bond with and understand each other. Play is what creates our strongest social circles. What are we doing to add play back into our schools, and back into our children’s lives as parents, teachers, and leaders? When we look at the research, the studies, the medical community’s recommendation, and the real life stories of schools in the US and abroad–it all shows the importance of free play. Let’s go beyond recognizing the need, and start intentionally providing time and space for play. The student sees the activity as personally meaningful. The student’s level of interest is sufficiently high that he/she persists in the face of difficulty. The student finds the task sufficiently challenging that she believes she will accomplish something of worth by doing it. This was my major problem as a high school English teacher. I was working so hard to engage my students in content that I (and the school district) had chosen for them. Often, my strategies would work in getting their attention. But usually, it was based on extrinsic goals and motivation that did not last and was tied to an incentive (grade). Students are more motivated academically when they have a positive relationshipwith their teacher. The solution came in the form of a 20% Project and Genius Hour, which I’ve written about extensively in my blog and my book, Inquiry & Innovation in the Classroom. My students chose the content, documented their research and learning process, developed an action plan, created a product based on their learnings, and then shared it with the world in some type of presentation. The power of Genius Hour and 20% Time projects to drive intrinsic motivation and true engagement matches what most of the research says about engagement and motivation. It’s not a surprise, but it does take a leap of faith to allow this type of learning to take place inside most schools. It may not be the complete answer to the drop in student engagement, but it is a start. I believe it is a start worth trying and doing in every school. I want my kids to be educated in a world that believes in their potential to do amazing and influential work. I want my kids to be educated in a world that says, “It’s ok to struggle, that means you need to work hard to overcome”. I want my kids to be educated in a world where teachers have time to give extra help, and have the freedom to change the curriculum or the day’s lesson plans based on her knowledge of the students. I want my kids to be educated in a world that empowers them to learn like they did in pre-school…with enchantment and wonder. And I want my kids educated in a world where engagement rises and anxiety is not on the rise. Interested in learning more? I’m teaching an online course for The University of Pennsylvania’s Graduate School of Education that goes into detail about Genius Hour, inquiry-based learning, and engagement. You can learn more and pre-register here. Thanks for this AJ – totally get what your TEDx student was saying about that feeling of ‘shutting down’ though the process of schooling. It’s been about 15 months since that Free Range Human lady I mentioned alongside you in that Easter post (http://leahkstewart.com/economy/) suggested I ‘act like a naughty kid’ and do whatever I felt like doing and that was all it took to for me to start creating my own work in education. So simple and a great message – Become that Little Kid Again! As an economics teacher I see an economic dimension to the rise in mental health counselling. Essentially it is a well proven track for firms to achieve growth by taking what they are already doing and extending it to a new demographic. This requires some level of adaptation to the new audience and some “advertising” i.e. convincing them that they have a problem you can treat. I see clear signs of this in the stats you quote. I am not belittling the problem but comparisons between different periods are made invalid by this kind of activity. The argument is that the problems existed before but were not recognised as such. b) that the thing we are not doing is playing. Great article and a great topic for debate. You hit the nail on the head! Not only that, but in America we put our children on a pedestal, where there are taught believe they are the center of the universe. In other countries, they are part of a team- whether it be society or their family. They exist not just for their own selfish gain, or as bragging rights for parents, but to be necessary part of that family. Not to mention that they are content with what they have; while in the United States it’s never quite enough. I also would ponder that technology use is having an impact, and not always in a positive manner. Too many parents use it as a baby sitter, and these children aren’t encouraged to play and create, they don’t spend endless hours outside building and making huge messes, not to mention relationships. That and our ridiculous pharmaceutical dependence, our inability to be uncomfortable. Thank you for your insight- I have lived abroad in many nations, but never with the opportunity to teach! Love this insight Amber! It is a tough line, that I think many parents (including my wife and me) struggle to walk. I want my kids to have free play and be encouraged to create, but I also want to help them in areas of life where our system doesn’t allow for those to activities. I think these are the discussions we need to be having, in our schools, in our communities, and in our households. This is a great topic for further discussion or debate. At the same time; let’s not down-play learning. Obviously, there are positive implications for play inside and outside the classroom. But, let’s not get too hasty and throw out the bathwater with the baby and replace learning with play. I think there is a place for learning (inquiry based, project based, performance based, etc. ); the focus should also be on what is that our students are doing or learning in class. I agree that we need to also look at how technology has impacted student learning. I believe that play can be connected to innovation, engagement, and learning. You’re right….it’s [play] not the complete answer to the drop in engagement in schools, but – it’s worth discussing and trying in schools, communities, and home. I totally agree. In the end it’s not a choice between play or learning. It’s entirely possible to have something that meets both objectives. For me the definition of learning is critical to this debate. A narrow definition like knowing that 2 + 2 = 4, is very restrictive and potentially competitive. On the other hand, learning social skills implies a wider concept of learning, doesn’t have to be competitive and can be achieved without any conflict with playing. I love this perspective. I don’t think we need to go “overboard” (keeping with the water analogy 🙂 – But, I do think we need to look at how we are spending our time. Often we jump to conclusions and then swing the pendulum completely one way. Let’s see what it looks like with some balance!